Do you have a business that you promote outdoors? Do you face problems in managing your stall during rains and when the weather is windy? If yes, then this inflatable promotional tents from Stand Banner is a perfect device for you. Made from a polyester fabric, this tent can be erect in just a few minutes by pumping air from a pump. You can peg the tent into soft ground so that it remains stable even when winds are flowing at high speeds. 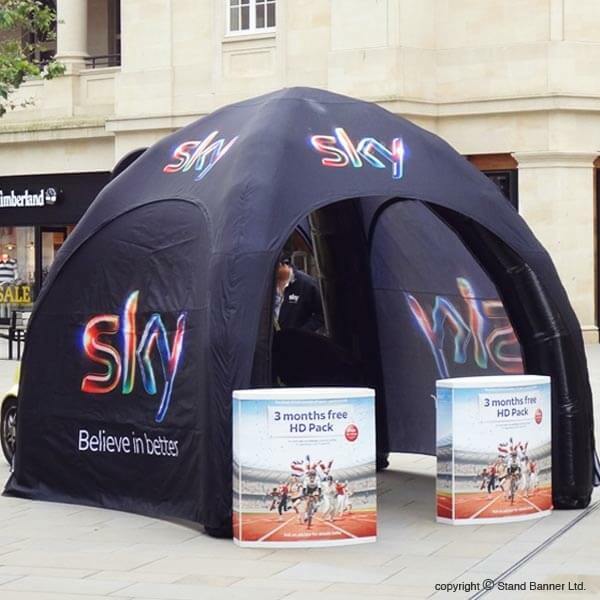 Inflatable marketing tent is not just a lightweight and portable alternative to a more expensive gazebo; it also comes with printed walls to do the marketing of your products. These walls are optional but they become necessary if you want to avoid the expenditure on ordering digitally printed banners to catch the attention of the visitors. 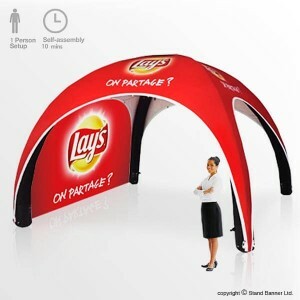 This innovative marketing tent has dimensions of 2649 X 3000 X 3000mm and it is large enough to keep a table and stalls inside in addition to the products that you want to promote or sell. The fabric used for making this marketing tent is polyester with the outer shell having double layer PE. This strong tent, once it is erect and inflated and also pegged into soft ground, can withstand wind speeds of up to 24k mph to make sure you do not run for cover or safety in windy and dusty conditions. The fabric is waterproof which means your products and yourself remain dry even when it starts to rain suddenly. The main attraction of this promotional tent is without a doubt its branded printed walls. You can choose to have single side printed walls though it is possible to have walls printed on both sides. This means you catch the attention of your customers not just when they are moving near to your tent but also when they have come inside. 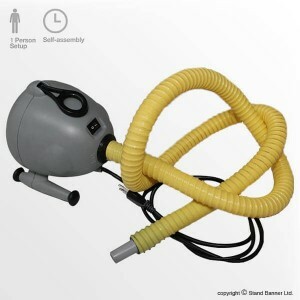 This creates brand awareness and is ideal for promoting your business. 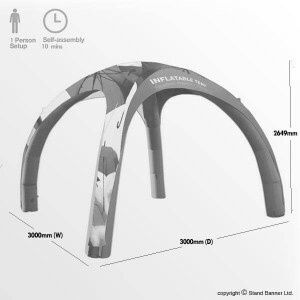 Inflatable promotional tents comes with a puncture repair unit to make sure that your tent remains erect even when it gets punctured as you can repair it and inflate the tent using the pump. The entire unit weighs less than 10kg which means you can deflate, fold it and keep the tent inside a carry bag to easily move from one place to another. What is more, this carry bag comes with wheels fitted to it. So simply drag along your promotional tents as if you are casually moving in a mall with your suitcase. For more information on our products please visit Banner Stand for free friendly impartial advice.